The image that I used in my first page design banner. I still love it. During this giveaway week, I thought I'd indulge myself by sharing some reminiscences about the past five years of Just Hungry. Today: Why I started the site. I've always been obsessed with food on many levels, and I've also been blogging since about 1998 or so. This was back when blogs were still pretty obscure. One day I wrote a couple of things on my 'weblog'; one about a visit to one of the first Apple Stores in New Jersey, one about a wierd/funny dinner experience. My 'weblog' post about the Apple Store somehow got discovered by an Apple fan forum. Many of the forum commenters disagreed with my opinion, and then proceeded to make vicious remarks about the rest of my site. I shouldn't have bothered about these anonymous opinions, but they really stung me. I wasn't used to it. So, soon after I deleted my whole site contents, dumped the homebrewed weblogging system I was using (that I really regret) and for a while my personal site was a stark Under Construction page. But yet...I couldn't seem to get out of the safe place of talking mostly about web-geeky stuff. I still loved to write, but I couldn't get out of a box I'd built around myself. Then, I somehow got a discount coupon for a new hosted blogging service called Typepad. Somewhat on a whim, I decided to start up a blog there and make it all about food. I called it I Was Just Really Very Hungry, after the title of one of M.F.K. Fisher's essays (more about my admiration for M.F.K.Fisher). I dove into the food blog without any kind of planning. Designing the site was easy for me (since I did that for a living). Content wise...I just wrote about the food I loved. Most of my early posts had a less than stellar one or simply no photo at all. (Food blog photography was not nearly as sophisticated, not to mention competitive, as it is now.) I didn't really plan to make it a blog mostly about Japanese food either. But, since I am Japanese and I love Japanese food, that aspect of it gradually evolved. There have been ups and downs, but five years later...it's still here! And now finally, today's giveaway! Please check the giveaway rules in the first post. Do try to remember to keep it to one comment per item/entry, thanks! Remember: You need to give me your email address (in the email entry area) where I can contact you if you win, your name (or nickname), and your location (country). Saisai Gohan (菜菜ごはん) is a vegan Japanese cookbook by one of my favorite cookbook authors in any language, Yumiko Kano. I've referred to her works several times (a listing of several of her books) and she is one of my biggest inspirations when I want to cook healthy, tasty vegan Japanese food. She's published several books on the same theme, but Saisai Gohan (which means 'vegetable meal') is the starting point. All the recipes in Saisai Gohan are dairy and egg free. They do not use traditional dashi, but rely on the natural flavors and sweetness of the vegetables she uses (she doesn't always add things like mirin or sake either, unlike most other Japanese cookbooks). Maple syrup or amazake are used as sweeteners, especially in her dessert recipes. It is not gluten-free since she does use wheat flour, seitan and fu, though many of the recipes are gluten-free. It even has desserts! Please note that this is in Japanese, and does not come with a translation, so some knowledge of Japanese is useful; although there's a clear photograph for each recipe, there are no step-by-step photos. DEADLINE: Your comment/entry must be posted before Midnight Greenwich Mean Time on Friday, December 5th. This giveaway is now closed. Thank you for participating! Be sure to check out the front page for the giveaways still open. The winner will be announced next week! Submitted by maki on 2008-12-02 13:16. Congrats to your fantastic blogs. Love especially Just Bento. Ohhhh this book looks wonderful. Even if I don't win I am going to buy it when I go to Japan, definitely! P.S. Have you ever made homemade natto? It sounds complicated but I wondering if it is possible because I crave it constantly and there is definitely nowhere to buy it in Ecuador. What a delicious looking book! Vegan? Japanese? I am so in. Loving the blog! Happy anniversary! Really nice to know the background of your blog, which I really enjoy reading. There is so much to find, and you are so knowledgeable... the book looks really interesting (and the Nigella we can buy ourselves can't we?) Keep on posting Makichan! Contest aside this will be a great addition to my collection for my daughter with the egg and milk allergies. Thanks for the information! I just wanted to say that that banner picture was one of my favorites, too. I still find it amazing that if we hadn't both started on TypePad, I would have never been a loyal reader of yours, and would have never ventured as far into blogworld (and foodblogworld, for that matter) as I have. Oooh, I've been meaning to buy this book anyway. I'll take a shot at it. I'm in the United States. Congrats on the 5 year anniversary~ I absolutely love your blog. I'm really interested in that cookbook as a Japanese student. A Japanese cookbook! I love looking at the pictures even if I don't always know exactly what the recipes say. 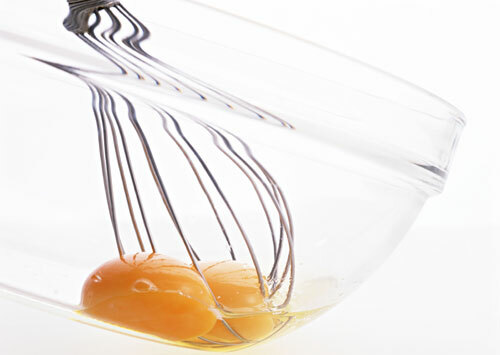 That about-to-whisk-eggs image is amazing! I like how everyday things can always be seen in a different light. oh, I remember my first blog. It has since gone into extended hibernation. I admire your 5 years of blogging! How cool is it to see comments from readers from all corners of the world? Way to go! Ann in Canada. M.F.K. Fisher is such an excellent essayist. I taught a Fisher essay in one of my composition courses last year. I am a relatively new reader to your blog so I was not aware of the author until now. I just read a few of the reviews on amazon, looks like I may have to pick up one or two of her books while I am in Japan over the new year. The book looks fabulous. I am fortunate to have a Japanese husband who loves to cook...so we would greatly enjoy it! I just moved back to the U.S. after living in Japan for 2 years. I'd love to use this book. Your sites are so awesome! And this cookbook looks really rad...even if I don't win it, I might try and check it out. Hello. May you enjoy many more happy anniversaries. I'm a British-born woman living in the USA who travelled in Japan several times on business in the 1990's. How delighted I was to be introduced to bento boxes. (My father had been in India so I also knew about tiffin lunches.) With the beautiful Bento book, perhaps I would be able to bring back happy tastes and memories. For some reason my comments are not showing either. Nevertheless, I wish you many more happy anniversaries and happy adventures. I can't say why, but the elegance of this book reminded my of my Grandmother (who was Polish, not Japanese). She always managed to set an elegant table, even if all we were eating was cream cheese and honey on toasted pumpernickel bread (still one of my favorites!). I'm glad you came back to blogging and didn't let that early setback stop you - you were just ahead of your time. For some reason my first try didn't show up. I was rambling on how this elegant book reminded me of my Grandmother. She could set an elegant table anytime, even if we were only eating cream cheese and honey on toasted pumpernickel bread! Is there a book like this(not using sake) in English that you can recommend? It's hard to find decent vegan recipes, let alone Japanese cuisine. Thanks for introducing me to a whole new world of eats. Just hungry is great; I hope you keep it up for another five years! From Anna in Wellington, New Zealand. I'm so sorry those jerks had to ruin your experience for you the first time around. I'm a computer geek too but sometimes the technophiles are the just cruel and stupid if you disagree with whatever their holy grail is. It reminds me of the time one of my friends started screaming and then refused to speak to me over which text editor I was using! Anyway, back to food, you are responsible for my having discovered Yumiko Kano's works, and I'm so grateful. That book looks awesome. Thank you for your sites! Your writing, your humor, and your appreciation of so many different foods has inspired me in how I approach cooking and food. Thank you! We're so glad you didn't give up forever, thank you for writing about what you love! Wow, the Japanese really know how to make it all look good. Can't read Japanese, although I took a semester of it. All knowledge has since evaporated. Whaou !! This book looks faboulous !! I have heard of Yumiko Kano's work through your blogs. I am vegan and would love to own Saisai Gohan. That is a really great photo. This book would be a great way for me to make myself practice kanji. I really enjoy your site. I think what I loved most was the international nature: Japanese, with full mastery of other languages (just something I look for all the time), living in a country that doesn't necessarily cater to your heritage's diet. I remember one of the first posts I read from your blog was about language - that you don't feel one is really fluent until you dream in a language, and I have to say, I have yet to find anyone else who has articulated that better. I haven't followed you since you began, but from what you describe years ago, you've definitely become a delight to read (and get ideas for meals from) - all 3 of your blogs. And I'm from Vancouver/Toronto, Canada - since I'm a student, I go back and forth. Have a great holiday and hope you have time to keep blogging despite all the busy celebrations! I just lived in Tokyo for a year and I wish I had seen that book! Thanks for all the great posts and happy anniversary. Thanks for sharing your food admiration with us! I should check this book for sure. Once I´ve heard that it is very difficult to be vegetarian in Japan... because most of food includes fish, fish stock etc. Well, I disagreed (and told that they just don´t know how to prepare it ;)) . I am glad you decided to start again after that first experience. ...for 5 wonderful years!!! This site has been the bright point of so many days! Thank you for so many wonderful posts! Keep up the good work! The cookbook looks beautiful and inspiring! Keep up the great work. We were talking about Japanese fruits and veggies in my Japanese class the other day.... so this book fits in perfectly! Grats again! So many pretty things you're giving away. And I'm in Australia, for the record. Happy 5 Years (again) and hopefully many more years to come!! That cookbook looks sooo awesome!!!! I've enjoyed your work since it was "I was just really very hungry". Thanks for the inspiration and the recipes. food blogs are always a good idea! i am glad you've kept it up this long. 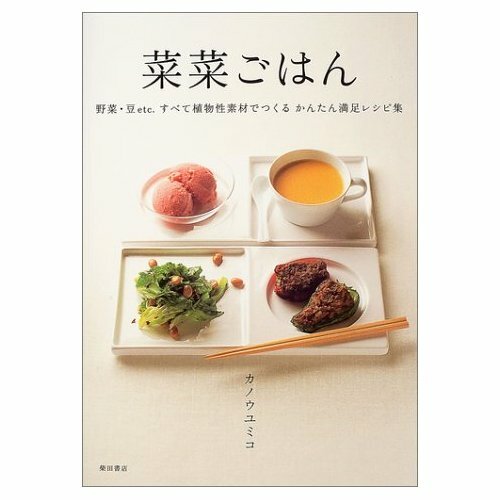 this book looks amazing, as i am both a vegan and a japanese food enthusiast. This book looks just as great as the others, even moreso to me since I'm very interested in veganism and was vegan for 2 years before I had to give it up for health reasons. I'm going to see if my library has any of her books, it looks great! I foud the recipe for the Japanese University sweet potatoes and even my husband said that he wanted to try it! I'd love to win this book, even tho I can't read Japanese (but I have friends who can!). Great - a challenge and some practice for my Nihongo. :) Would love to win it (pick me pick me pick me) - I'm always in search of a good, authentic Japanese cookbook. Thank you! Congratulations on a great blog! I really have wanted a Japanese vegetarian cookbook for some time. It would really be great to learn what to order next time I'm in Japan. This may just inspire me to learn some Japanese just yet. Thanks for sharing with us. Best wishes! Hey... It's my birthday too! If I win, I’ll send you something back as a thank you! Thanks!! This is a really good one!! I love your blogs, please keep on posting Japanese food recipes, I love Japanese food. Sayward Portland, OR Oh Yay! Oh Yay! I have been scouring the earth for a vegan japanese cookbook! SO exciting! I found some chapters on the Gourmet site of MFK Fisher's writings that have never been published. I can't find it any more on the site but I do have it in Word form. Send me a private email and I'll mail it to you. I went to a techie chat that was so busy, the screen rolled pretty quickly. I noticed someone asking incredibly stupid and weird questions about easy tech stuff, and figured he was trying to bait someone. I decided to play, and answered some of his questions in an equally stupid way. No other chatters had noticed his questions were weird, but they certainly noticed my weird responses, and jumped all over me. I had to type: "scroll up and read his earlier questions", a few times before some of them caught on to my game, and joined in the fun. My experience with 'techies gone mean' was fun, but it was also a very good lesson: tread carefully, because they turn vicious pretty quick. Your other contest for the Japanese book I can get by just looking at the photos, but this one requires reading, so leave me out of this one. This is really fun! Thank you for brightening my day with the contest and the great website! I am vegetarian, I have learn many Japanese food culture from you and cooked the food with your recipes, also I got inspired from your recipe to cook difference vegetarian food. I can enjoy traditional Japanese homemade food, variety and elegant taste in vegetarian dishes everyday. My boyfriend (European) also turned to be vegetarian, eat rice, miso soup and tofu with me after I cooked with your recipes. And I have done カレー, 自家製豆腐 and 自家製納豆 successfully. Thanks very much for the time and effort u have put into these sites! Thank you very much for a great giveaway and an even better website which I really enjoy! The sites are great! I'm sorry people treated you so badly, but we readers are lucky it led to this! I love the image too! Thanks for all you do with this (and your other blogs). As a long-time vegetarian and Japanese student, they have really inspired me! started my own cooking blog and I hope it's half as successful as yours! I love your site :) and it's so kind of you to host these giveaways! Thank you for being such an inspiration to all of us aspiring and hungry bento-makers! What a beautiful book! I'm a vegetarian and my fiance and I are both learning Japanese. This book could get exciting! I've always turned to your site to find delicious vegetarian foods, and you've never let me down! I like cooking japanese recipes. This book looks really interesting. Well, this is the first comment I've put on your site, and (even without the contest) I'll make sure this isn't the only one. I've really enjoyed the various type of food that you have posted. Just being curious, but do you have any from Okinawa? To be honest, I haven't had a chance to go through everything yet but I don't remember seeing anything. Happy Anniversary! Love hearing these stories about how you got started! Happy blogiversary! I enjoy your blog as I merge Japanese food/culture here in NJ with my family and friends. Well, if I win this prize I doubt my high school Japanese will be any help, but the pictures look beautiful! Well, I don't read Japanese, but I've been wanting to learn. If I win this book, maybe I'll be inspired! That cookbook looks awesome and it reminds me of an interesting project in Japanese class where we had to find a Japanese recipe online and try cooking the food ourselves! Opening each new issue of Just Hungry and Just Bento is already just like getting a great present (and so often!). Your anniversary giveaways are icing on a fabulous cake. Thanks for it all. Your sites are so awesome! I want to win so bad! i am glad you started this food blog and i love it because it features japanese food, healthy food, and loads of veggies. really useful for a foreigner living in japan. your giveaways get better everyday! :D thank you! This book looks great; Thanks for doing this give away! I'm glad you got back to writing again. From Australia... great idea to have a giveaway, thanks for being so generous. Love the blog. love your site! looks like a beautiful book. Love your site! hope you have many years to come! Your story reminded me of my first blog... Thanks for sharing these little stories along the recipes! I find them interesting and engaging. Your blog is a wonderful read for hungry souls. I first stumbled across it because of your entries on Provence. I love how you manage to find all the good food in so many places, and now, I enjoy reading all the recipes, especially the vegetarian/vegan ones, since I am a vegetarian myself. Thanks for the marvelous sharings and Happy Anniversary! Keep the gems coming! a good way to study kanji! Oh what a faboulous cookbook! I love your picture too! All these giveaways are so fun!! I have really enjoyed using and reading your sites. I've been wanting to find a Japanese veggie or vegan cookbook! How thoughtful! I actually wanted to comment on the Nigella Lawson page, and as it is 8.05am Friday 5th here in New Zealand was fairly sure it couldn't be after midnight Thursday 5th GMT, but that post is closed for comments already. Sniff. I do enjoy your blog Maki, and have got quite into the habit of Bento boxes in winter. And a collection of the boxes. It is summer now and I am dieting, so I am eating vast quantities of calorie-almost-free foods such as lettuce and capsicum and suchlike that don't fit into bentos. As a Brit of Japanese origin with an interest in European food, I've been reading with interest for years. Love both blogs! Who thought that such a wonderful (and wonderfully useful) site would rise from such humble beginnings? Huzzah food blogging! Anyway, I also wanted to say, thank YOU for having these blogs! I stumbled onto it about six months ago, and have been an avid reader since. Your blog was also the first food blog I really read-- and it's stayed my favorite one, the more I read them (still the most entertaining, unpretentious, informative and useful one I've encountered). Oh my god, I hope I win! Thanks so much! thanks for running two great sites. i love japanese cookbooks that have a modern feel to them. and it's veggie to boot. even if i can't read japanese very well, i still find them inspiring and never tire of looking at them. How awesome for you to share your love with the world! That book looks awesome! If I won I would definitely learn some Japanese.